Farmers and other stakeholders’ views on potential major options to improve biomass production and marketing through identifying opportunities and constraints. Do you agree with our focus on the intersection between crops and livestock? Are we excluding any important elements? Are the aspects proposed appropriate? Is anything missing? Are there too many? Should any of these aspects be prioritized before others? The focus on the intersection between crops and livestock are generally ok. But to my opinion feed production and utilization (using crop residues and + some) might not transorm or intensify livestock production, it may improve the mainatenace feed supply in the system. To improve and transform livestock prodyctivity 1. feed (quality feed) should be supply not only to improve mainatence requirement of animal but for production. 2. The main burden of animal production (for cattle) that is keeping cattle for the purpose of animal traction should be minimized through improvement of farm implements and agricultural mechanization. 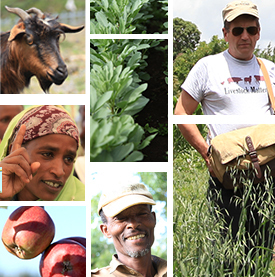 I agree with the focus on the intersection between crops and livestok, as this is an issue of uttermost importance in Ethiopia and other regions of Africa (e.g., in West Africa). Under a systemic approach, I would like to see included site (soil, topography, climate) as a third relevant component, and possibly also trees, in addition to crops. Proposed aspects are appropriate. Items 3 and 4 could be consolidated under management of the whole system. A value chain approach (inputs, production systems, markets and value-added components) could be useful. Given limited funding resources, I feel that prioritization would be needed after the first two days of the workshop. I agree with the focus on crop and livestock intersection, where it is considered as the major production system on the highlands of Ethiopia. There is a great degree of symbiosis between crop and livestock production as long as it is done under proper land use plan and management. Issues related to crop protection and animal healthcare however, need to be incorporated. The discussion would benefit from consideration of agroforestry’s place in these highland farming systems. Many of the farmers, whether in the high potential areas or the “resource poor” Productive Safety Net area of the highlands are dealing with highly degraded landscapes, many with steep slopes that should not be in continuous cultivation, and severe soil erosion. Reclaiming the degraded areas and restoring the productive capacity to bring these areas into sustainable intensive systems will need to include consideration of the watershed management approach and agroforestry options. Crop and livestock intersection is important but how do ensure that the carrying capacity of the natural resources is not exceeded in areas where already the land and water resources are under extreme pressure? Do we have a good sense of how many farmers can sustainably intensify production in the highlands with a mix of crops and livestock or at least a way we can model this? The focus on BOTH livestock and crops is a must. Reative to livestock focus must be on production of feed resources to improve production capabilities. Choices of breeds to improve production under these conditions should be considered. Finally consideration should also be given to development of disease resitance livestock. There is value with a farming systems approach integrating crops and livestock with good farmer participation. The markets and supply aspect is of highest priority, especially for this approach; this determines opportunities and smallholders respond well to convincing opportunities. The dilemma of crop residue removal, excessive tillage, deterioration of soil physical properties, and poor water infiltration is a serious problem but of long tradition and not easily changed; livestock enterprises that result in long term rotations of grazing or cut-and-carry perennials with annual crops would much reduce this problem with considerable increase in annual crop yield. As it is, land and water use efficiency tend to be extremely low; mean maize yield in Ethiopia per cubic meter of water received may be about 0.4 kg compared with 2 kg for much maize production in Nebraska. More adaptive research is needed; for example, recommended fertilizer rates are generally above the economically optimal, especially for resource poor farmers who are able to buy only a small amount of fertilizer and need to maximize returns on their investment rather than per hectare; good information is needed on the crop-nutrient-rate combinations that will maximize returns on investment. Yes, I think the focus on crop-livestock interactions is sensible given the composition of the research team and the fact that there are successful projects in this area to build upon, e.g. the Systemwide Livestock Programme Crop Residues project which is just finishing. I also think that the bullet on institutional arrangements is a key one. This is where the main blockages to intensification are and the project should be researching ways of overcoming these blockages. E.g. the separation of livestock and crop research disciplines in the NARS, the separation of crop and livestock development agents at woreda level and so on. It is important that we do good interdisciplinary research on this project but also that we address the wider lack of interdisciplinarity in the innovation system. The focus on the intersection is good. It would be helpful to know which mixed-farm types and what socio-ecological contexts are the best platforms for transitioning to sustainable intensification. One issue that needs to be addressed (as others have stated) is the emergence of infectious diseases emerge in connection with intensification . How can sustainable intensification occur without increasing disease incidence? It may be important to prioritize based on the intersecting issues of gender, health (animal, environmental, and human) and markets. For example, research on sustainable intensification systems for small ruminants may be prioritized because of the opportunities afforded women, the low resource demands, and the responsiveness of markets.